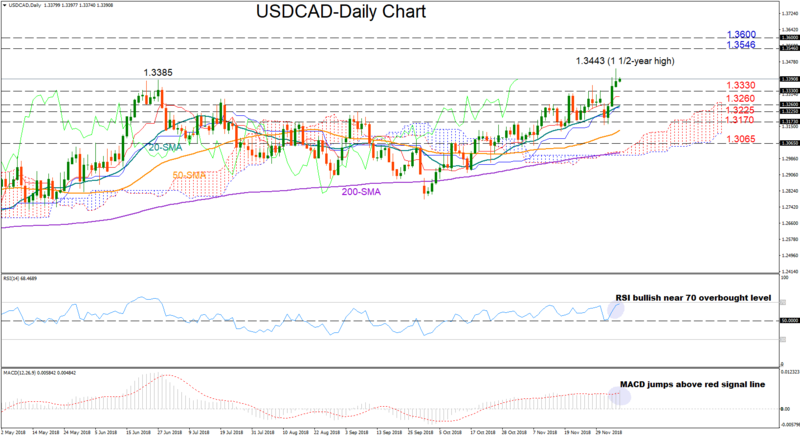 USDCAD pierced a key resistance around 1.3385 on Thursday and spiked to a 1 ½-year high of 1.3443, deviating further above its moving averages which are positively sloped, a sign that the uptrend could continue. Momentum indicators are also in bullish territory, with the MACD crossing above its red signal line and the RSI fluctuating well above its 50 neutral mark. Yet downside corrections cannot be ruled out in the short term as the latter is just about to touch the 70 overbought limit. An extension to the upside would likely retest yesterday’s peak of 1.3443. Higher than that, positive momentum could speed up towards the 1.3546-1.3600 area, where bullish action paused in previous years, whilst a break of that region could send the price up to 1.3792, the top on April 2017. A reversal to the downside could rest around 1.3330, while lower, the pair could pause between the familiar key levels of 1.3260 and 1.3225. Below that, the 1.3170 barrier could offer support as well, though if that fails to hold, the next stop could be near 1.3065. Looking at the bigger picture, the recent rally indicates that the pair is preparing to exit neutrality and start a bullish phase, with the 50-day simple moving average supporting this view; the line is gaining strength again above the 200-day SMA. Summarizing, USDCAD is bullish in short term, while in the medium term the outlook is neutral to positive. Forex trading and trading in other leveraged products involves a significant level of risk and is not suitable for all investors.